SRINAGAR: People continued to suffer in the valley as the civilian traffic on most part of the 300-km-long Kashmir-Jammu National Highway (NH) was once again suspended from 4 AM to 5 PM, starting from Udhampur this side to Baramulla through Srinagar on Sunday, the third of the 16 days notified for the exclusive movement of security forces’ convoy to allow them free and secure movement. The State government on April 3 had ordered the traffic restrictions on Sundays and Wednesdays till May 31, for safe movement of security forces on the national highway, where it has been attacked by suicide bombers twice in less than two months. Business in weekly Sunday market of Srinagar, which used to attract thousands of customers from different part of the valley, was badly affected due to the ban as all the districts in the valley are interconnected with the national highway. The Jammu and Kashmir High Court (HC) last week issued notices to the Union Ministries of Defence, Home Affairs and Transport, the National Highway Authority of India (NHAI) and the state government, directing them to respond to pleas, seeking orders to scrap the highway ban, till April 19. The highway today wore a deserted look with only security forces, state police and Army personnel deployed in strength to prevent people from moving towards the highway though it is said that security force convoy, which left Jammu, will enter Kashmir only in the afternoon. However, district authorities have appointed nodal officers to help people to cross the highway at important places. Majority of the political parties in the state, including National Conference (NC), Peoples Democratic Party (PDP) and Congress, have opposed the ban and demanded its immediate revocation. Three former chief ministers, including NC president Farooq Abdullah, Vice President Omar Abdullah and PDP chief Mehbooba Mufti, even staged protest demonstrations separately on the highway against the ban. Officials said that the entire stretch of highway has been divided into different zones and magistrates, along with police, have been placed at every zone of the highway to allow people with medical emergency, government employees, tourists, schools buses and election rallies. 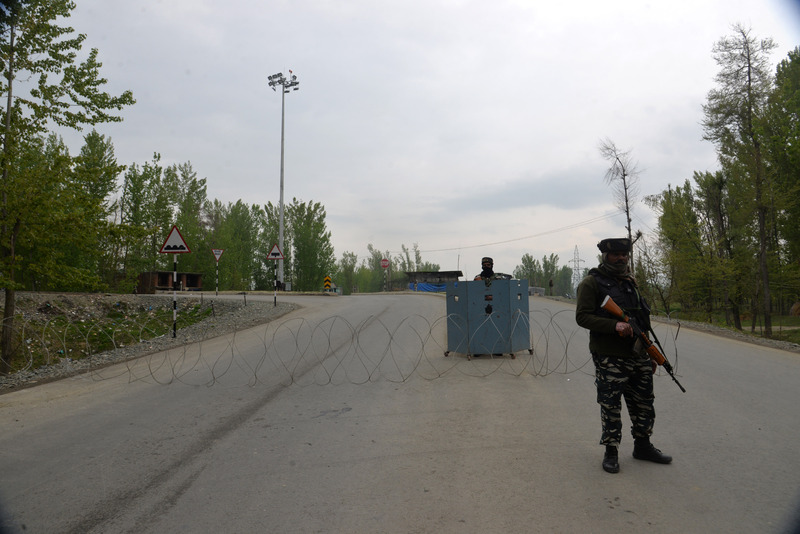 Security forces have closed roads connect the highway between Baramulla in north Kashmir and Jammu with other roads with barbed wires to stop civilian vehicles from coming on the national highway, which also connects different districts of the valley with each other. Only security force convoys could be seen plying on the national highway. Business in the 3-km-long weekly market from Radio Kashmir (RK), Srinagar, crossing to Hari Singh High Streets (HSHS), including historic Lal Chowk, the nerve centre of the summer capital, was badly affected as customers from other districts are not able to reach Srinagar on Sundays due to the ban. “Our business has been reduced by more than 70 per cent due to the highway ban. Customers used to come to this market from different districts, but now that the highway is closed none of them is able to reach here. All the districts are connected with each other through the highway, it is ironic that the government has imposed this ban,” Tahir Ahmad, a vendor, who has been putting up a stall in Sunday market from many years, told. Roadside vendors and people, whose shops, including hotels, are along the highway, expressed concern over the ban, claiming that it will badly affect their business. “I have been running my fruit shop at Hyderpora bypass, for past many years. If I have to close the shop for two days in a week, how can I make both the ends meet? The government should revoke the ban on civilian movement,” Shabir Ahmad told TNN. Similar views were also expressed by workers at 'Dhabas' (local restaurants) along the national highway. A division bench of Chief Justice Gita Mittal and Justice Tashi Rabstan last week directed the state government and other parties to file their response to the PILs, before or by the next date of hearing on April 19. The notices were issued by the HC, while hearing the Public Interest Litigations (PILs) filed by a battery of lawyers representing the petitioners - including bureaucrat-turned-politician Shah Faesal, National Conference's Ali Muhammad Sagar, Peoples Democratic Party's Naeem Akhter and three lawyers - seeking striking down of the ban on the movement of civilian traffic on the Kashmir-Jammu national highway, for two days a week.